An all-terrain vehicle is just as much about fun as it is function. With a focus on prowess and speed as well as maneuverability and stability, a Yamaha all-terrain vehicle offers one of the most top of the line options on the market today. When you need to make a repair or upgrade to your model, we are your source for all the best solutions in Yamaha ATV parts. When looking at the history of the Yamaha all-terrain vehicle, you have to go back to 1980 when they introduced their first model. Their first models were pretty standard for the time and underwent several years of tweaking and fine-tuning until they reached the level of expertise and excellence expected of a brand that made a name for themselves on the racing abilities of their motorbikes. With their early models on three wheels, such as the Tri-Moto, the 225DX, and the Tri-Zinger, they were all about speed and style, yet they lacked the level of safety and stability Yamaha was striving to achieve for riders. By the time they introduced their 4-wheel YFM200 ATV in 1985, they had worked out the issues that were holding them back and the rest is history. Offering some of the best performance measures on matters such as engine capability and safety standards, Yamaha is a leader on the market for this type of vehicle. 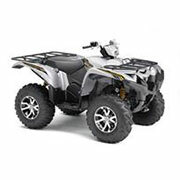 We are pleased to offer a large selection of Yamaha ATV parts to help keep your model performing at the high levels expected from such a respected name in the automotive world. With a selection of parts ranging from their early 80s models to the most current models on the market, we are confident you will find everything you need. We also offer all of the top models to ensure you get the best in OEM Yamaha ATV parts to meet the exact specifications of your vehicle. Whether shopping for solutions for a Grizzly 700 or a Big Bear 4WD, we have you covered with our extensive selection of solutions. We are an authorized Yamaha dealer, so you can buy with confidence knowing you are getting the best solutions direct from the manufacturer of your vehicle. Please contact us with any questions while shopping for further assistance.